US National Security Advisor John Bolton meets PM Netanyahu at Prime Minister's Residence in Jerusalem to discuss US-Israel ties. US National Security Advisor John Bolton met Sunday with Israeli Prime Minister Binyamin Netanyahu during a dinner at the Prime Minister's Residence in Jerusalem. 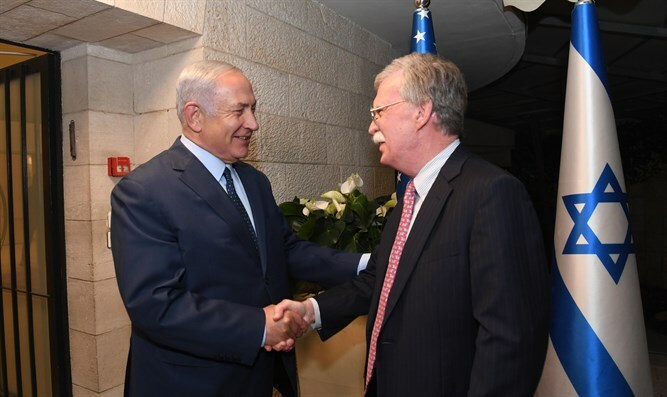 At the start of the meeting, Netanyahu said: "Ambassador Bolton, John, it's a pleasure to see you. We've been friends for many years and I can testify that in and out of office, you are a tremendous friend of Israel, a tremendous champion of the America-Israel alliance." "It is particularly momentous to welcome you here after the momentous decisions of President Trump: move the embassy to Jerusalem, get out of the terrible Iran deal." Netanyahu added. "And I look forward to discussing a whole range of topics. But the most important is how to continue to roll back Iran's aggression in the region and to make sure that they never have a nuclear weapon." Bolton responded: "It’s a great honor to be here. It’s great to see you again and talk about the US-Israel relationship." "It’s been an exciting year and a half in the Trump administration with some of the things you’ve mentioned. Obviously we’ve got great challenges, for Israel, for the United States and the whole world. The Iran nuclear weapons program, the ballistic missile programs are right at the top of the list. So I’m delighted to be here, and look forward to our discussions."